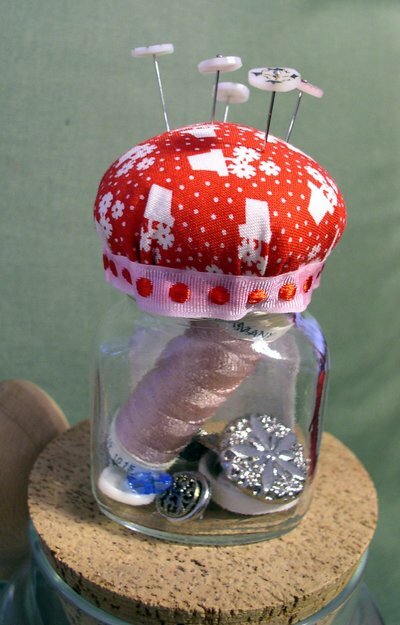 This month's Pincushion Challenge theme was "Recycle!" Finally, an opportunity to use one of the many little jars I can't bear to throw away and make something out of it. 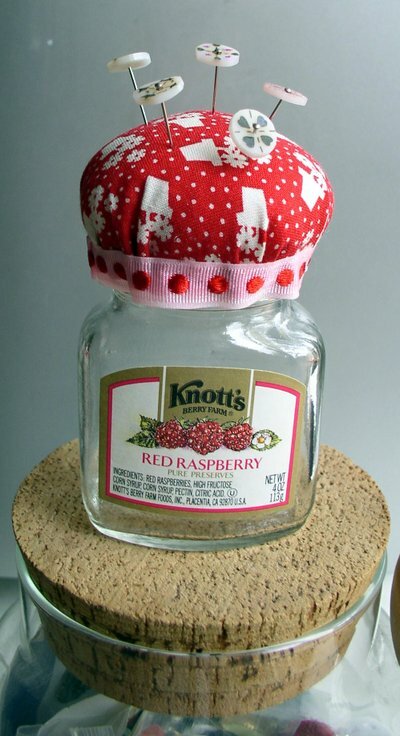 With a sampler jar of Knott's jam as the base, I turned the lid into a no-brainer pincushion, making sure that it could still be screwed on and off. That way, the jar is still useable, and I can store little bits of things in the bottom. My daughter helped me pick out the fabric and ribbon, and she picked some buttons and thread out of my stash that she deemed worthy enough to be stored away. It stands about 3 inches tall, the fabric is a scrap of a 30's reproduction. Like last time, this was another really fast one. I'm quite happy with the way it turned out, even though it's uh, a little primitive, shall we say? But I think it fits the theme and looks very appropriate somehow. that is so so cool!! and as I was looking at the first pic and reading, I thought to myself - you could keep buttons in there- then I scrolled down and the next picture, lo and behold!! love it! This is so cute! Great idea to use a jelly jar! I love all the different takes on the recycle theme I've seen, this is adorable!